Some of the devastation caused by the fight to remove ISIS from Raqqa, Syria. 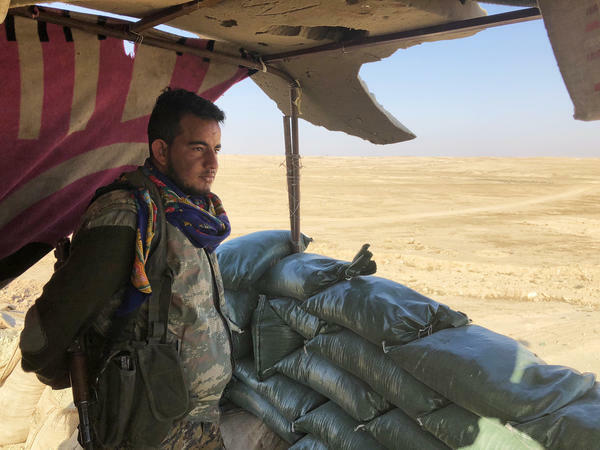 A soldier with the Syrian Democratic Forces looks out on the front-line with ISIS in Eastern Syria. 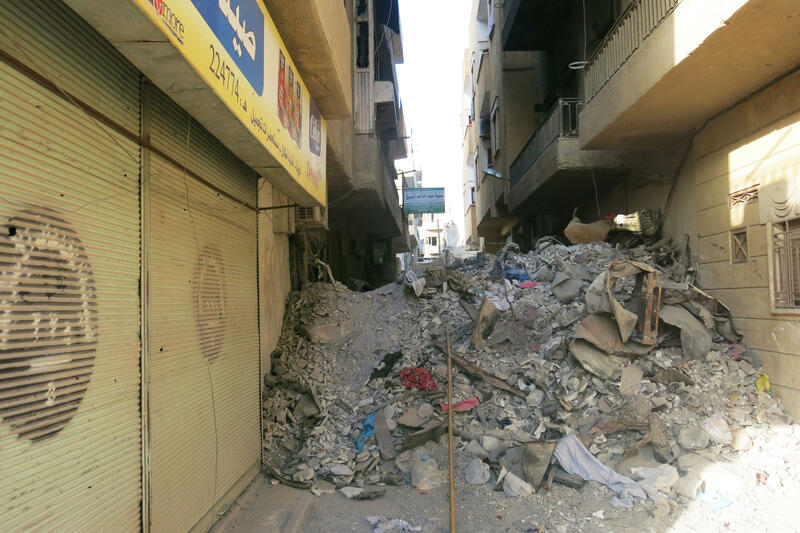 Piles of rubble and debris are everywhere in Raqqa. A child walks through a section of Raqqa that is being rebuilt. 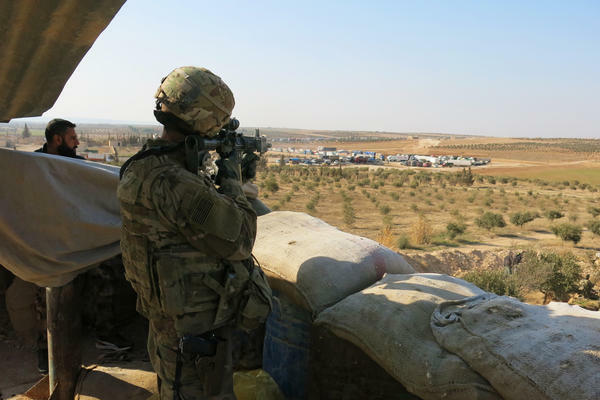 A member of the U.S. Military stands watch at an observation post outside Manbij, near the front-line with Turkish backed forces. 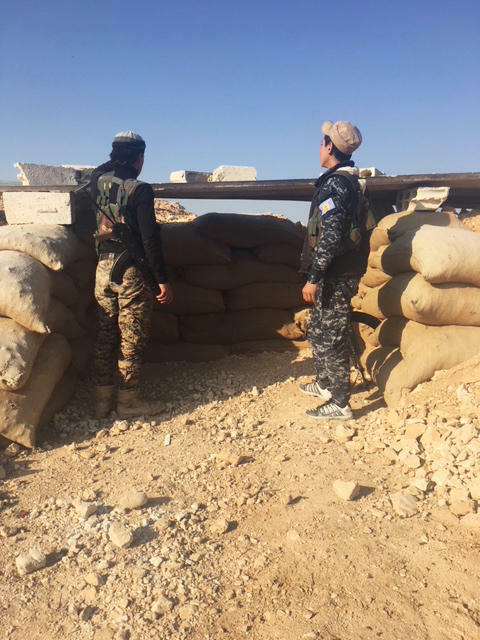 Syrian Democratic Forces stand guard at an observation post outside Manbij- near the front-line with Turkish backed forces. 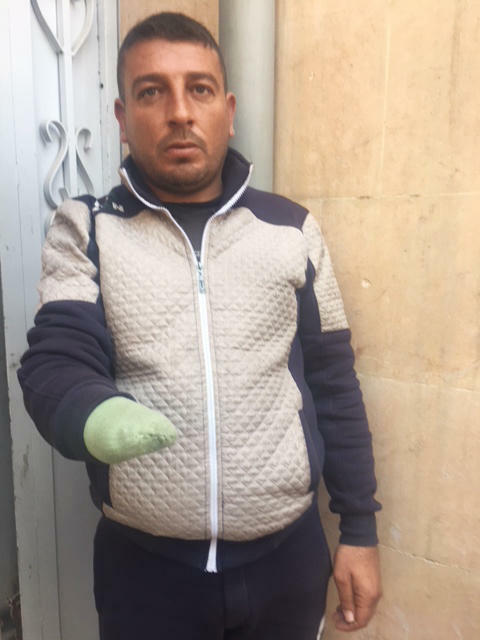 This man says ISIS cut off his hand after accusing him of a theft which he says he did not commit. These girls are happy to be back in school in Manbij, Syria. When ISIS ruled the city, they were unable to attend school. "That place. That village farm is the place for ISIS," says Hassan. "A couple of kilometers. After this there are many villages controlled by ISIS." Hassan knows that at some point his troops will have to leave their base and take on ISIS. But that may have to wait. Because right now some of his fighters are leaving, heading to the northwest part of Syria to a place called Afrin. The Turkish army is battling their Kurdish comrades there. Why? Because Turkey considers the Kurdish forces terrorists, linked to the deadly Kurdish separatists in Turkey. But the Americans say the Kurds are the best fighters against ISIS, and they plan on supporting them well after ISIS is defeated, in an estimated two to six months. Hassan also is sending some of his reserve forces south to counter attacks by pro-Syrian regime forces that include Russian mercenaries. The U.S. military attacked those forces and killed at least 100 with withering airstrikes just last week. The Russians are supporting the Syrian regime and are supposed to coordinate any military activity with the Kurds and the Americans, in order to prevent unintended engagement. It's called "deconfliction." Hassan said he reached out to the Russians when some 500 of those mercenaries were seen massing. 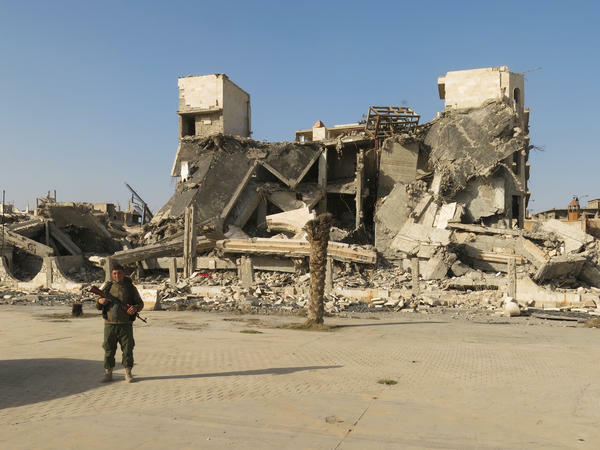 The Russians denied anything was happening, and repeated the denials even when those mercenaries were shelling a Kurdish base that included American special operations advisers. The mercenaries' artillery fire came within 500 yards of the base, officials said. And that's when the U.S. launched its airstrikes. Hassan said it was only then that the Russians acknowledged the attack. They asked if they could collect the dead. The multiple fronts have splintered Hassan's forces. Some are heading north, others south. "That worries me," Hassan says. "These two forces, if I have availability under my control, I will defeat ISIS more." The outpost can only wait to take on ISIS, even though ISIS fires an occasional rocket or mortar at them. One officer who is not worried is Army Maj. Gen. Jamie Jarrard, who commands the U.S. special operations forces both in Syria and Iraq. His troops are assisting the Kurds and he's here for a visit to this outpost. He says ISIS is on the ropes. "What we characterize this currently is a little bit of a transient area," he says, looking out over the desert. "There's no significant terrain, there's no significant urban area that they desire to hold onto permanently. This is not where they wanted to be." Where ISIS wanted to be is 100 miles west of here along the Euphrates River in the city of Raqqa. It was their de facto capital for three years, until they were defeated in October. 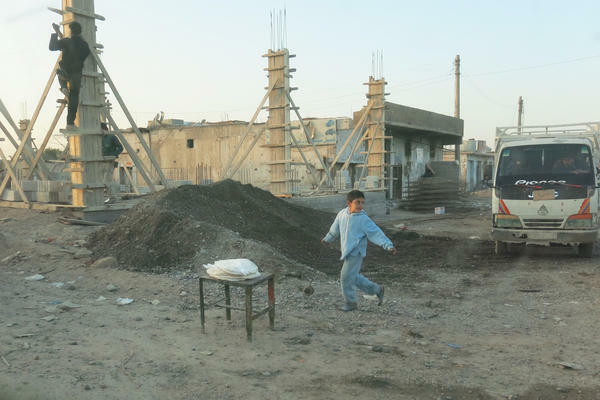 They're no longer a threat but today Raqqa is little more than a pile of rubble with traffic. Imagine those black-and-white photos from World War II. The German cities of Dresden or Hamburg that were flattened by allied airstrikes. Driving along, every so often there's movement in the debris: a man shoveling plaster. Another man and his son walking from the skeleton of a house. Children filling buckets at a humanitarian water station. Abu Basr commands the local security forces here. Behind him is the crumpled building that once was the headquarters of the Islamic State caliphate. He recalls what life was like when ISIS fighters patrolled these streets. Smoking was prohibited. So too was wearing brightly colored clothes. Women would be beaten for not having their faces covered. Businesses had to close for prayer. He says mostly people spent the three years of ISIS control at home, rarely venturing out. "We were not able to leave our house," he says. "And if we had to, we would have to check ourselves because if ISIS saw something they didn't like, they would immediately have put us in jail. Immediately." Abu Basr's son was detained for a month. His crime? Smoking a cigarette. More serious crimes — like working with Kurdish forces or helping the U.S. coordinate airstrikes — meant certain execution, often a beheading next to the nearby clock tower in the center of the city. Abu Basr says those memories will linger. "They showed us what terrorism really is," he said. "Revenge was taken for anything. There was no justice. They would immediately grab a person, the citizen, place him in a crowded area and take revenge." Now the focus is on rebuilding. The U.S. military says it could take at least another year until this part of Syria is stabilized. The U.S. is spending one billion dollars a year in the liberated areas on humanitarian aid and small projects, like fixing water pipes and electric substations and cleaning out irrigation canals so farming can resume. One immediate job is removing the thousands of explosive booby traps that ISIS laid before they fled Raqqa. They're everywhere. In front doors. Chairs and couches. Cooking pots. Abu Basr says residents are told not to return home until their houses can be screened for bombs. Many don't listen. So there are dozens of casualties each week. "The vast majority are adult men but we do see some women and about 10 percent kids," says Christina, a surgeon with the American special operations forces, who can only use her first name for security reasons. "Whoever you talk to, everyone is kind of touched by this. Their brothers have been killed, or their father has been killed." Christina says about 95 percent of the people she treats survive. But the wounds can be horrific, and at times include the loss of at least one limb. Amid all the devastation and horror is an oasis. It's the Royal Restaurant, and it's reputed to serve the best shawarma sandwiches in the city. It's a small storefront with a long narrow corridor of tables and chairs. A large hunk of lamb cooks and spins out front on a spit. The owner, Muhammad Jabara, stayed open during the Islamic State caliphate. He's a heavy-set man, wearing a black leather coat and weary look. He says ISIS fighters would often come in for lunch. "Once you see an ISIS you want to make sure, just do whatever they want," he says, "make them just leave your place as soon as possible so you don't get in trouble." Jabara says ISIS jailed a relative and threatened to behead him, but he was eventually released. Still, he knew some that weren't so lucky and were executed. Everyone was in fear. Jabara is a heavy smoker and he would snuff out his cigarette when ISIS members approached. He recalls, they could smell it on his clothes — and warned him. Farther north is the city of Manbij, and it seems like it's in full recovery. It was liberated from ISIS 16 months ago. There's a bustling market with plenty of fruits and vegetables, clothing, gold jewelry and baked goods. One baker showed off a large bowl of sweet fried dough balls, something like doughnut holes. Bite into one and it explodes in your mouth with a blast of honey. For that reason, they're called "bombs." ISIS fighters liked those, too. Nearby is a kiosk with a man selling perfume and cologne, all set in aluminum jars behind him. He's been open for two decades and ISIS would come by and shop for cologne, he recalls. Their favorite? An earthy concoction called "al Misk." "It's very Arabian," says the shop owner. "It's an Eastern type of cologne, it's just for men. It stays very long." But even in this seemingly normal scene there are hints of the brutality of ISIS rule. There's a man with his right hand gone, the stump covered in green fabric. ISIS fighters accused him of a theft he says he didn't commit. He was jailed for 20 days, strung up by his hands and one leg like a marionette. Then he was flogged, and told he would lose a hand. His wife and children knew he was being held but were too afraid to ask where. Now the man says he is forced to beg. He can't work to support his family. Still, he says he's lucky. "Thanks to God, my head was not cut off," he says. ISIS is gone, but now there's a new problem facing Manbij. The U.S. is backing Kurdish fighters here. But Turkey sees them as terrorists, linked to militants in Turkey. And so Turkey and their local allies are attacking the Kurds just a few miles away. Turkey has even threatened to invade Manbij. The U.S. wants Turkey to stop, so the focus can remain on defeating ISIS. And American officers — echoing Defense Secretary Jim Mattis and Secretary of State Rex Tillerson — say they are here to stay, to prevent a return of ISIS, to help the Kurds and to help stabilize this area so it's not a breeding ground for terrorists. The problem is no one can say how long that will be. Despite all the tensions, there is hope. It can be found inside a classroom at a girls' high school, a building recently used as an ISIS prison. The two dozen girls are smiling and joking when visitors appear. They wear colorful pink and purple and red hijabs that were banned by an ISIS force that demanded only black could be worn. 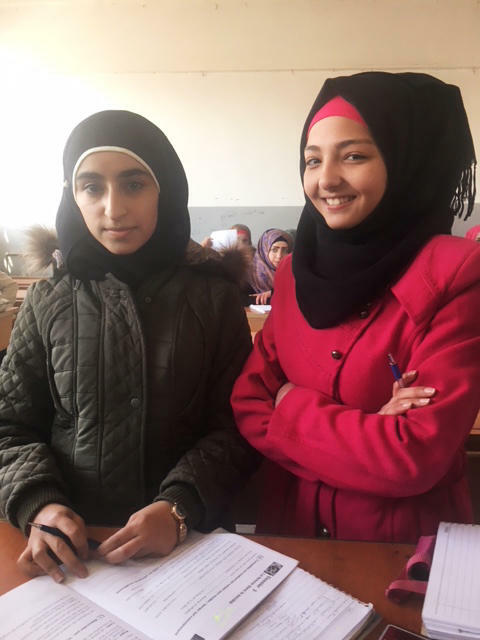 They didn't attend school under ISIS and rarely saw their friends. Now they talk about attending university, about studying English, about a better future. "This is very happy and exciting to back to school in this year," says one student in halting English. Another adds, "There isn't any worry because we are now in the peaceful." Peaceful. At least for now. We're going down to three places in Syria that explain just how tough it will be to bring peace there even after the defeat of ISIS. The Islamic State does still hold some small pockets, but is largely routed. And different countries are vying for control of the land ISIS left behind with U.S. troops, Kurdish forces and the Turkish military all in the mix. NPR's Tom Bowman just spent four days in northeastern Syria with the U.S. military, and he takes us on this journey through three towns. He starts outside Shaddadi. UNIDENTIFIED MAN #1: (Speaking Kurdish). TOM BOWMAN, BYLINE: The Kurdish soldiers stand watch at this outpost. Most carry simple assault rifles. A few hold heavy machine guns. They stand behind a barricade, just a semicircle of sandbags and hardened earth. UNIDENTIFIED MAN #2: (Through interpreter) This is the front line. BOWMAN: This is the front line? Can we go up the stairs and look? Even the stairs to this lookout are made of dirt, like some prehistoric fortress on a vast, open plain in eastern Syria. General Hassan commands these Kurdish forces who are fighting the Islamic State. He's a short, squat man with salt-and-pepper hair. And he points out where the enemy is located in the empty distance. HASSAN: (Through interpreter) That's village farm. That's a place for ISIS. BOWMAN: So about 2 miles, 3 miles away? HASSAN: (Through interpreter) Three or 4 kilometers. BOWMAN: You can barely pick out a couple of mud huts on the horizon. HASSAN: (Through interpreter) After these hills there's many village. They are controlled all by ISIS. BOWMAN: But Hassan has a problem - some of his troops are leaving to fight Turkish forces who are attacking Kurds in northwest Syria. And to the south, he's had to send some of his reserve forces to shore up the line against pro-Syrian regime militias. HASSAN: (Through interpreter) Yes, that's worry me because these two forces, if I have availability under my control, I will defeat ISIS more. BOWMAN: Even though some of the Kurdish fighters are straying, Major General Jamie Jarrard isn't worried. He leads the American special operations forces here and says ISIS is on the ropes. MAJ GEN JAMIE JARRARD: What we characterize this currently as is a little bit of a transient area. There's no significant terrain. There's no significant urban area that they can - that they desire to hold on to permanently. And this is not where they wanted to be. BOWMAN: Where ISIS wanted to be is a hundred miles west of here along the Euphrates River in the city of Raqqa. It was their de facto capital for three years until they were defeated in October. They're no longer a threat, but today Raqqa is little more than a pile of rubble with traffic. Think of those black-and-white photos from World War II of Hamburg and Dresden after they were flattened by Allied airstrikes. Driving along, every so often there's movement in the debris - a man shoveling plaster, children filling buckets at a water station. BOWMAN: Abu Basr commands the local security forces here. He recalls what life was like under ISIS. Mostly people spent the years in their homes, he says, rarely going outside. BASR: (Through interpreter) We couldn't leave the house. And if we had to, we'd check ourselves first and see if there was something ISIS wouldn't like because if they saw something they didn't like, they would immediately have put us in jail - immediately. BOWMAN: His own son was detained by ISIS for a month. His crime - smoking a cigarette. More serious crimes like helping Kurdish forces meant execution, often beheading next to a nearby clock tower. Abu Basr says those memories will linger. BASR: (Through interpreter) They showed us what terrorism is. They took revenge for anything. There was no justice here, no fairness. They would simply grab the person, place them in a crowded area, take their revenge. BOWMAN: Now the focus is on rebuilding. The U.S. military says it could take at least another year until this part of Syria is stabilized. The immediate job is removing the thousands of explosive booby traps ISIS laid before they retreated from Raqqa. They're everywhere - in front doors, chairs, cooking pots. Local residents are told not to return home until their houses can be screened for bombs. But many return home anyway, so there are some three dozen casualties each week. CHRISTINA: The vast majority are adult men, but we do see some women and probably 10 percent kids. BOWMAN: That's Christina, a surgeon with the U.S. Special Operations Forces who can only use her first name for security reasons. CHRISTINA: Whoever you talk to, everyone is kind of touched by this. Like, all their brothers have been killed or, you know, their father has been killed. BOWMAN: Amid all the devastation in Raqqa is an oasis - the Royal Restaurant. It's a small storefront that sells sandwiches. The owner, Muhammad Jabara, stayed open during the Islamic State caliphate. He wears a black leather coat and has a weary look. Were you nervous when the ISIS fighters came in here and asked for food? MUHAMMAD JABARA: (Through interpreter) Once you see an ISIS, you want to make sure just do whatever they want, make them just leave your place as soon as possible so you don't get in trouble. BOWMAN: Farther north is the city of Manbij. It seems like it's in full recovery. It was liberated from ISIS 16 months ago. There's a bustling market, plenty of fruits and vegetables, clothing, gold jewelry, even a man selling perfume and cologne. He sold to ISIS. Their favorite - a cologne called El Misk. UNIDENTIFIED MAN #3: (Through interpreter) It's very Arabian. It's Eastern type of cologne. It's just for men. It stays very long. BOWMAN: But in this bustling city, there are still reminders of ISIS brutality - a man with his right hand gone, the stump covered in green fabric. ISIS fighters accused him of a theft he says he didn't commit. He was held 20 days, dangling by his arms, flogged a hundred times. But he says he's lucky. UNIDENTIFIED MAN #4: (Foreign language spoken). BOWMAN: "Yes, and thanks to God my head was not cut off." ISIS is gone, but now there's a new problem. The U.S. is backing Kurdish fighters here, but Turkey sees them as terrorists linked to militants in Turkey. And so Turkey and their local allies are attacking them just a few miles from here. The U.S. wants Turkey to stop so the focus can remain on defeating ISIS. And American officers say they're here to stay. No one will say how long. And there are signs of hope inside a classroom at a girls' high school, a building once used by ISIS as a prison. The two dozen girls are smiling and joking when the visitors appear. They wear colorful pink and purple and red hijabs that were banned by ISIS, which only allowed the color black. They didn't attend school under ISIS. Now some practice their English. UNIDENTIFIED GIRL: That is very happy and exciting to back to school in this year. There isn't any worry because we are now in the peaceful. BOWMAN: Peaceful - at least for now. Tom Bowman, NPR News, northeast Syria. (SOUNDBITE OF IF THESE TREES COULD TALK'S "THE GIVING TREE") Transcript provided by NPR, Copyright NPR.